Dimensions: 8 3/4" x 11 1/4"
This beautiful full-color book examines the Trenton New Jersey, Trenton Potteries' transformation from producing sanitary ware to artware. It features over 300 color photos of Trenton art pottery, including: Deco vases, lamps, wall pockets, Neo-Classical centerpieces, jardinieres, and much more. Each piece features a description and current market value. The informative text covers: manufacturer's marks, glaze colors, industrial designers, company advertising brochures, etc. 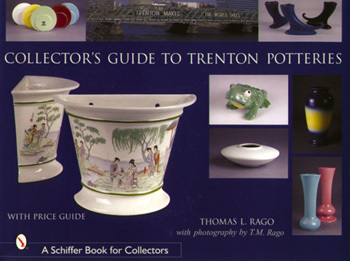 For any fan or collector of the Trenton Potteries, this book is a must-have.